This month’s Petite Fashion Challenge, hosted by Really Petite (thanks for hosting! ), was to put together a professional outfit for under $100, with bonus points if you included shoes and accessories in the price. I managed to meet the challenge, shoes and all! I’m including two photos, but they’re basically the same outfit. I got these beautiful argyle-knit cardigans from New York & Company several weeks ago, and I’m enjoying trying to figure out how to wear them. I couldn’t decide what looked best here, so I thought I’d include both and ask for opinions. What do you like better? Blue or Yellow? Tucked or untucked? Cardigans: New York & Company Pointelle Argyle Pattern Cardigan in Olympic Blue and Yellow (yellow is sold out online now). Originally $49.95 each, but on sale at buy one, get one half off, and I also had a 30 percent off coupon, making each one $26.25. Skirt: Banana Republic pencil skirt. Found at Goodwill for $5; total cost with alterations about $20. Tank top: Old Navy Jersey-Stretch Tank in Russian Navy, $10. Earrings: Cracker Barrel, of all places, approximately $6. I had a great time with this challenge. I know I try to shop smart, price-wise, but I never really think about how much an entire outfit costs. Because I’m a college student, most of my clothes are inexpensive, but I guess it all adds up! A fun learning experience. Can’t wait for the next challenge! It definitely looks better tucked in! Otherwise, it’s kind of sloppy. I think so, too. 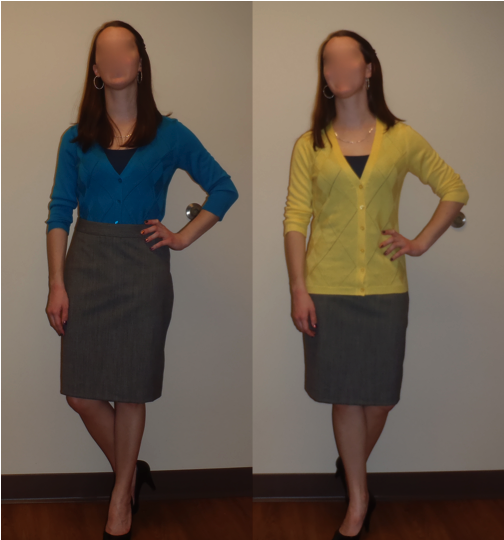 I could probably do untucked with a pair of jeans, but pencil skirts work best with streamlined outfits, and an untucked cardigan doesn’t really work there! Do you think I could wear the cardigan with a belt, or would the belt and argyle be too much? I like your outfits! I prefer the tucked in look. I think adding a belt to the untucked cardigan would work. Great jobs on the outfits and for keeping both under $100. I can't use Google Friend Connect or anything handy like that, but you can follow be notified of new posts by email! Cool, right?